Visit Waiheke was established in 2003, and I, Richard Potter, bought the business in 2008. Having travelled to over 52 countries myself, I am aware that every holidaymaker’s dream is the ‘home from home – but better’ experience. The best accommodation Waiheke has to offer: Looking for somewhere pet friendly? Check. Searching for the perfect beach house for a traditional family holiday? Check. Wondering which places are cosy in winter? Check. Looking for the perfect wedding venue? Check. Want to treat a loved one to a romantic getaway? Check. Got a large group you need to accommodate? Check. Whatever type of accommodation you’re looking for on Waiheke, we can help you. Highest quality fittings and appliances: It's the little touches that make a difference to your holiday: crisp premium linen on your bed; modern stylish wine glasses and crockery; sharp knives in the kitchen; an iPod dock; a dishwasher or dish drawers. We’ve thought about the little things, so you can put your feet up and enjoy the comfort and luxury. Local knowledge and recommendations: Having a folder with local brochures and takeaway menus is all well and good, but in addition to that, if you need help choosing the perfect restaurant or activity from experience, just contact us. We’re here to help you make the most out of your time on Waiheke Island. We’ve lived on the island for more than 10 years so we know all the best places for you to check out. Book with confidence: your money-back Guarantee: If a property you’ve booked becomes unavailable for any reason, we’ll find you satisfactory alternative accommodation – or you can choose to have your money refunded. 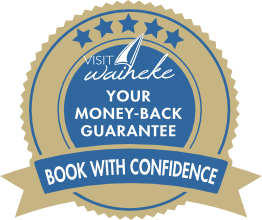 Should a property become unavailable, be sold, double booked, or unliveable for any reason (the reason to be verified by Visit Waiheke as being justified), then Visit Waiheke will use their best endeavours to find you satisfactory alternative accommodation. It is at the sole discretion of the guest to accept or reject the alternative accommodation. Should a replacement property not be available, or the guest is not satisfied with the alternative suggested, all monies paid by the guest to Visit Waiheke will be refunded in full. Visit Waiheke's liability is limited to the refunding of such monies and no more. Excellent communication very friendly. Went the extra mile to assist with queries .thankyou. Pleasant to deal with and very knowledgeable about Waiheke. Easy to deal with & left us alone to enjoy or holiday. Richard was a pleasure to deal with. His friendly nature and willingness to share his local knowledge of the best spots to visit, made our trip all the more enjoyable. Richard met my friends on arrival as was very informative about activities and things to do on the island. I would definitely recommended to others and many of my friends were asking how to book again. Richard was great. Quick and easy communication. Everything ran smoothly. Fantastic communication. We had to reschedule the arrival time a couple of times with no issues at all. Richard and Sharonagh were wonderful to deal with and were extremely helpful. They were available to be called if necessary and we had to ring them once to get help with an appliance that wasn't working. We had a fabulous weekend. Richard answered any queries promptly and organised cots for our stay which were ready for us on arrival. We were greeted on arrival and given a delicious Waiheke Island bottle of wine.